Verywestham: It's Baggies versus the Saggies! Prematch Selection Surprises Await. It's Baggies versus the Saggies! Prematch Selection Surprises Await. If the solution is Song then the problem isn't too bad? Hammers fans will be hoping that last weekend's nightmare of No Heart Lane was a temporary blip as they look to put their sagging Eurospot ambitions back on track today. However, Tony Pulis' West Brom are no pushovers and after slaying the Gooners last weekend will be looking to bounce in to the top half of the table with a win today. Meanwhile, West ham are trying to adjust to life without Dimitri Payet and have a host of options at Slaven Bilic's disposal with Song, Obiang, Ogbonna and Antonio all looking to enter the fray. 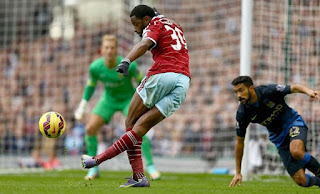 Manuel Lanzini will almost certainly be asked to provide direct replacement for Payet as the central attacking midfielder, but many feel it is time to unleash the increasingly frustrated Michail Antonio as a wide option. With Mauro Zarate also available, much of the prematch speculation is around who will partner Lanzini and Moses in midfield. With Mark Noble suspended, Pedro Obiang and Alex Song will be competing for the vacant central midfield berth. With both short of match fitness, expect whoever starts to give way around the hour mark. Up front, Sakho and Carroll will be competing for a start leading the line. It remains unclear which one of theae options is favoured by Bilic and when, so today's selection will tell a lot. At the back, Victor Ogbonna will feel that a starting spot should be his and maybe James Tomkins will move to right back as of the back four, Jenks looks most out of sorts right now. We would all love to see the Hammers go at it from the off in an effort to erase the painful thumping from last week, but that rarely works well against Pulis sides who love to soak up pressure and hit on the counterattack. Slaven Bilic is a canny operator and is unlikely to get drawn out so easily so we might expect a cagey encounter. The last five Upton Park meetings of these two clubs have produced 3 draws and two victories for the home side. Btw, Mark Lawrenson is predicting a Hammers victory....which augers badly given his knowledge of our abilities! Kick off is at the unusual time of 14:05. Predicted starting XI: Adrian, Jenkinson, Cresswell, Reid, Ogbonna, Kouyate, Song, Moses, Zarate, Lanzini, Sakho.